What does your migraine cost you today? Are you losing income or vacation time because of taking sick days? Do you find that you have trouble focusing at work? Does migraine make you miss out on time with family and friends? Do the symptoms of migraine—or the side effects of migraine medications—hold you back from being your best self? In addition to the thousands of dollars in medication costs and doctors’ bills that patients with migraines pay each year, the lost work time and the diminished quality of life—caused by migraine pain and medication side effects—lead to an enormous cost, both financially and emotionally. 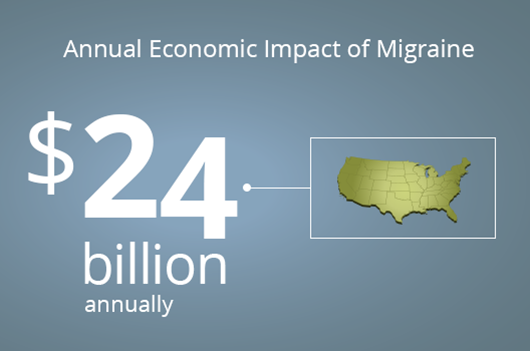 Migraine has a devastating financial impact of nearly $24 billion on the United States economy every year,7 and its impact on patients at a personal level is immeasurable. The value of a clinically proven, non-drug treatment option cannot be underestimated. Scientists and doctors have been seeking such a treatment for years. Now, headache specialists, patients, and even an increasing number of insurers have recognized that the sTMS mini by eNeura can make an invaluable, life-changing difference for people with migraine. eNeura is committed to helping migraine patients have access to the relief they need, when they need it. Before eNeura developed the sTMS mini, patients could only be treated in a specialist’s office with the help of trained technicians. Now, the sTMS mini allows sTMS treatment to be self-administered with a portable, simple-to-use device. As any migraine patient knows, once headache pain strikes, making a specialist appointment—and getting to the doctor’s office can be impossible. The portability of the sTMS mini is a major advance in migraine treatment. In addition to designing the sTMS mini so it’s small enough to use at home and carry with you on the go, eNeura makes it easy to get treatment started: Our Customer Care staff will coordinate your prescription with your doctor and arrange home delivery at your convenience. eNeura Access Consultants are available to help you review your healthcare benefits. They will assist you in exploring your funding options such as: HSA, FSA, HRAs, and Care Credit. eNeura also has discount programs to help you continue receiving treatment for as long as you need it. Like many migraine treatments, the sTMS mini may not be covered by all insurance plans, but our Access Consultants can help research your coverage, explain any deductibles associated with treatment, and advocate for you as needed. eNeura has made it easy and affordable to start treatment. In a world of high deductibles and co-pays, insurance coverage can be complicated. That’s why eNeura provides a $300* discount on your initial rental period (Regular price $750 for 3 months). No prior approvals or letters of medical necessity are required to get started. Like any medical treatment, migraine treatment with the sTMS mini is not equally effective for every patient. For patients who respond well, this treatment can be life-changing. For the first time in years, I have headache-free days.